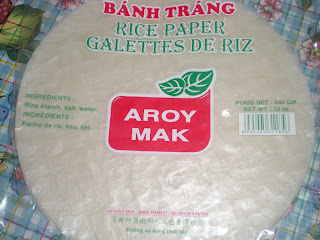 Last weekend, my mother made a dish that she learned from one of her friends using vietnamese rice paper wrappers. It was the first time she used these wrappers and the amazing thing is that you only need to submerge in hot water for a few seconds and it becomes transparent, soft and ready to use. My mother's recipes tend to be guestimated, the quantities for each ingredient are more or less accurate. So, adjust the ingredients according to your liking or create your own fillings. 1. If using dried fungus, soak wood ear fungus and/or cloud ear fungus in warm water for 15 mins. Drain and change water. Soak for 15 more minutes until soft. 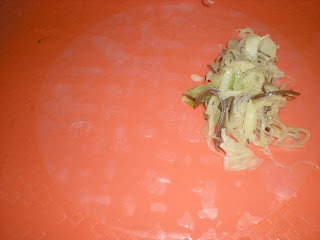 Rinse in cold water and cut fungus into julienne. 2. Bring a pot of water to a boil. Cook rice noodles for a minute. Drain and soak in cold water. 3. Meanwhile, in a large skillet, heat vegetable oil over medium heat. 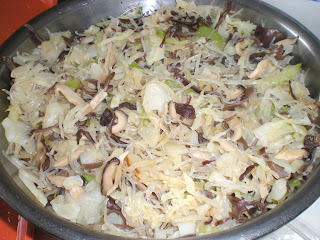 Cook cabbage and celery until soft. Stir occasionally. 4. Add in fungus and shiitake mushrooms. Cook for a minute. Stir in the rice noodle and adjust seasoning with soy sauce. 5. Transfer fillings into a large bowl. 6. Prepare a large bowl of hot water to soften the rice paper wrappers, water should be slightly unconfortable to the touch. 7. Submerge one dry wrapper in water completely and wait until it softens. 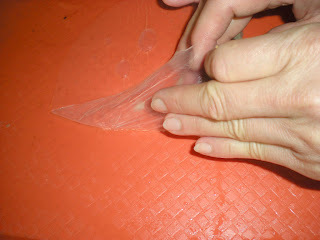 Depending on the temperature, it can be as fast as 5 seconds or 30 seconds to become soft and transparent. Don't worry if you broke the first few wrappers. 8. Transfer wrapper to a tray. Put filling at the edge of the wrapper. 9. 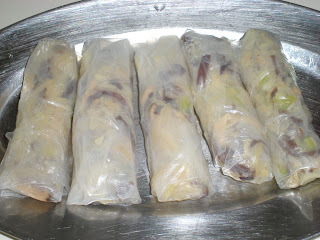 Gently roll the filling until past halfway. 10. Fold in the sides and roll it towards the end. Repeat the same procedure. 11. Serve with your favorite dipping. The classics : hoisin sauce, sweet and sour sauce, soy sauce, Worchestershire sauce. I love making these in the summer! 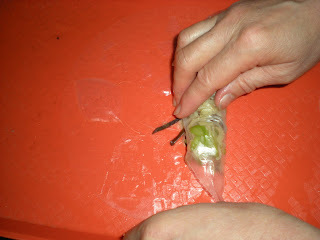 My mother's version includes lots of mint and coriander, noodles, lettuce, cucumber, carrots, soy sprouts, and shrimp. The only things that are cooked are the shrimp and noodles, so it's a very fresh, crunchy version. But this looks like a great version too - I love mushrooms! Regarding the rice wrappers: I like to use a set of stackable plastic trays with large slits in them (available in Chinatown). They're made specifically for moistening rice wrappers: you just dip everything in the water and drain it. The wrappers will stay moist, but won't disintegrate, and you can work faster. But maybe you're familiar with these trays already? That's true, I forgot about these stackable trays, my mother used to use these trays when she worked at a restaurant. I should try out your version. Must taste good also. I have not made these in so long. I call it the Asian fondue....get the ingredients around and let the guests do there own at the table lol. Looks good but wood ear fungus???? @Evelyne : I wasn't sure if you were commenting on the wrong link to the wood ear fungus. 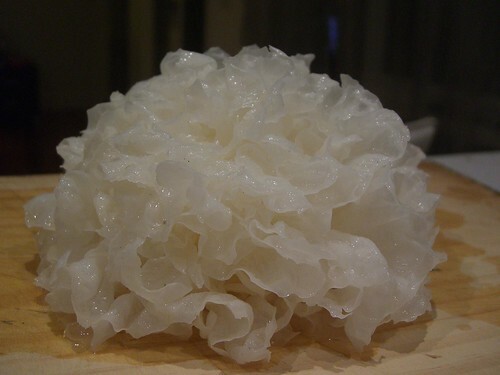 If not, wood ear fungus is soft and has a glutinous or crunch texture depending on how it is cooked. This ingredient is found in most hot and sour soup. These rolls look fantastic Victor! I'm going to try making them, my family would flip over these! Right up our alley, this will work perfectly for our Eat To Live "Greens and Beans" diet. Saving this one! And thank you!